Lemon Cake. Ella Milton. 1 cup melted butter 3 cups sugar 1 cup sweet milk 4 & 1/2 cups flour 6 eggs 2 teaspoons cream tartar 1 teaspoon soda - Stir butter & sugar to a cream & add eggs without beating separately. The filling is whites of 2 eggs & 1/2 lb. of white sugar beaten to a froth, with the rind & juice of 2 lemons or oranges - cocoanut is also good. Delicate Cake. Mrs. Ayers. 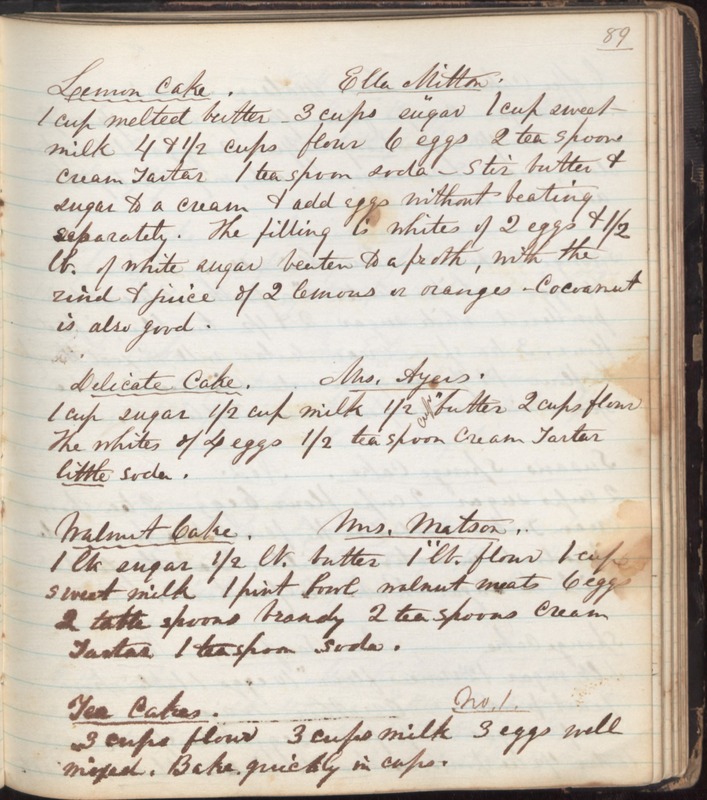 1 cup sugar 1/2 cup milk 1/2 cup butter 2 cups flour The whites of 4 eggs 1/2 teaspoon cream tartar little soda. Walnut Cake. Mrs. Matson. 1 lb sugar 1/2 lb. butter 1 lb. flour 1 cup sweet milk 1 pint bowl walnut meats 6 eggs 2 tablespoons brandy 2 teaspoons cream tartar 1 teaspoon soda. Tea Cakes. No 1. 3 cups flour 3 cups milk 3 eggs well mixed. Bake quickly in cups.